The way I determine my topics is by what is happening when I am working with clients at Accent Master. 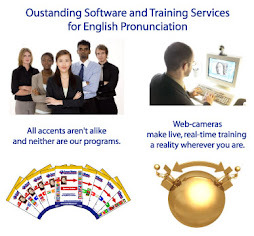 So what is happening now with our accent reduction clients? Can and can't. These two little words can add up to confusion in conversational English. . Often ESL speakers can't hear the difference and misunderstand American English speakers, and of course when using these words themselves can and can't end up sounding exactly alike. One issue is that when you say "can" or "can't in isolation, and not in connected speech they do indeed sound very much alike. However things change for a number of reasons when these words are used in connected speech. We are so positive! This means that we as listeners are expecting the affirmative. We are waiting to hear "can". This being so, can in a sentence is not stressed, in fact it is de-stressed. Meaning that we say it quickly and with a slight reduction of the vowel. This makes can sound more like "Ken" in connected speech. On the other hand any negative in a sentence (no, not, don't and can't) need to be stressed so your listener will pick up on the fact that their expected yes, is really a no. So in the sentence I can go with you. You would really say I ken go with you. Now change it a bit to I CAN'T go with you." Now the stress is falling on 'can't'. The trick in understanding and using can and can't is in the vowel. A short reduced "a" means that you "can" and longer bolder "a" means you "can't". It is not obvious, because if you look at the two words you assume it will be the "t" that holds the key to the difference in the word, but it is really the vowel! Practice saying sentences with 'can' and 'cant" using these rules. Try to incorporate these words into your speech today.